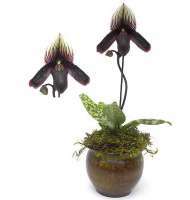 Below are some suggestions on how to evaluate your Home Orchid For Your Growing Conditions. You want your orchid to grow well after you purchase it, right? Before you purchase your plant you first need to look at where it will be spending its time. What is it going to like staying in a particular room? And which orchid variety will do best in that area. The room is fairly bright light but it does get a bit cold in your house, get an Odonoglossum. You live in South Florida and get plenty of sun as well as humidity, then a Vanda orchid is the one for you. A Brassia also does well in these conditions or in a greenhouse. An Oncidium is best suited for fairly bright areas. Also, you might find this article interesting. What to watch for when purchasing an orchid for your home.